Brocky: Good to read another who has "been there, done that". Glee, you are right about 2 things.. You have to spread some sand before you stop so it is under the tires. We also learned to put an "S curve" in the discharge hose so you could move the drives a couple of feet when about half unloaded. Tires cooled off and still some weight on the drives. I hauled a lot of petroleum from Syracuse to the St Lawrence river valley back in the years with a coupe cab White 4000, 220, 10 speed, and a tag axle!! 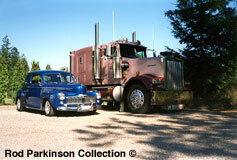 In the latter 1950s I drove a single axle petroleum transport for Marathon out of Toledo, Ohio. Our units there had sanders as we would get more snow and ice off Lake Erie. Best use was to dispense some sand just before the unit was stopped, so the drives would be on sand. The warm tires would melt some of the snow and ice, but they were sitting on sand and we could pull away easily after unloading. I think the 1959 model Internationals and Whites were the last year for sanders as most of the fleet was then tandem drives and sanders not needed as much. Their Elston Sanders and can still be bought today. Great for pulling off of a stop light or out of a dock. The company I drove for in the 60's had a few left on trucks but there was more in the scrap heap. They were always plugging up and if not filled with dried material would freeze up long before they were needed. With some of the long high mountain passes we ran the things had very limited use as opposed to chains. From what I've heard, they added weight, they only worked well on glare or black ice, slush would freeze them up, you couldn't carry enough sand for extended use, (more or less just to get you to the top of the hill) highway maintenance improved to the point that in most areas they weren't necessary and they rusted like crazy from the salted sand. And they didn't help you steer! I don't live up North, but have seen a Hopper / Sand Dispenser located in front of the drive wheels on some older restored trucks. Did this system work very well? Seems like a good idea but apparently not since it is not seen any more. Does anyone know the history of this traction device? It is interesting that Rail Road Locomotives use a similar system to enhance traction, I wonder if the two are related.